Meridian present across two volumes, the Complete String Quartets of Hans Gál. I noted that the slip-case that holds the two discs states ‘world première recording’. A 2002 musicweb-international review by Jürgen Schaarwächter of Gál’s disc of ‘Music for and with mandolin’ stated that, "Hans Gál is receiving somewhat of a revival." I have not detected any significant sea-change of attention being given to Gál’s music; it remains in the doldrums. As far as the record catalogues are concerned there appear to have been only a minor resurgence of interest with a trickle of all-Gál recordings. Perhaps the Gál recording most likely to be encountered is the 3-disc set from Leon McCawley of the ‘Complete Works for Piano Solo’, on Avie AV2064. A quick check has revealed that there are listed around thirty or so recordings that include a Gál work or two in their programme. Everything has to start somewhere and I remember the old adage, "Mighty oaks from little acorns grow." 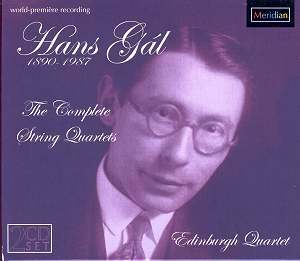 It is to be hoped that this excellently performed and recorded disc of the complete string quartets from the Edinburgh Quartet will serve as a catalyst for a revival of interest in the music of Hans Gál. Hans Gál, although not a completely new name to me, is a composer that I knew little about before receiving this Meridian release. The excellent Hans Gál website contains a wealth of information that I have drawn on extensively for this review. I have learned that Gál wrote 174 scores in a wide range of genres of which some 110 were published. It seems that over a fifty year association with Scotland more than half of Gál’s scores were composed in his adopted country. Born in Brunn, near Vienna, Gál studied at the New Vienna Conservatory and completed his doctorate there in 1913. In 1915 he won the Austrian State Prize for composition and was then drafted into the Austrian army the same year, serving in Serbia and the Polish Carpathians. His golden period from the end of the Great War to the early 1930s saw Gál develop as a composer with an increasing reputation in Viennese music circles and in other central European cities. In 1919 he was the recipient of the Rothschild Prize and secured a teaching post at Vienna University. Incidentally, this was the same post that had once been held by Anton Bruckner. The première of the comic opera Der Arzt der Sobeide (Sobeide's Doctor) in the Prussian city of Breslau in 1919 gave Gál considerable recognition. Increasingly he appeared as a pianist, especially in chamber music recitals and he would on occasion travel outside Vienna to promote his works. Gál’s breakthrough came with the acclaim given to his second opera, Die Heilige Ente (The Sacred Duck). Premièred under Georg Szell at Düsseldorf in 1923, the comic opera was soon staged in many European cities. The triumph of Die Heilige Ente was augmented by his third opera Das Lied der Nacht (The Song of the Night), a romantic drama that was premièred in 1926 in Breslau. Although operas brought Gál his initial success he was active in many other genres, with vocal music playing an essential role, as also that of chamber music and solo piano works. He founded a Madrigal Society in 1927 which at that time was unique in Vienna for performing a capella compositions. Gál’s orchestral works also provided him with success notably with his Overture to a Puppet Play (1923). This popular orchestral work soon achieved over a hundred performances in many European cities under the directorship of various eminent conductors: Szell, Furtwängler, Keilberth, Busch and Weingartner. Further compositional acclaim came in 1926 with the Vienna Art Prize award. Gál’s Symphony in D major, Op. 30 (1927) was awarded second place by the Columbia Broadcasting Corporation in 1928 to mark the centenary of Schubert's death. Incidentally, the Third Symphony of Franz Schmidt won the First Prize. In Vienna Gál cultivated a number of influential friendships with leading musicians of the day, including Alexander Wunderer the oboist, conductors Georg Szell, Erich Kleiber, Carl Prohaska and the composers Julius Bittner, Egon Kornauth and Karl Weigl. Despite having very different opinions to the avant-garde affiliates of the Second Viennese School, Gál had agreeable relationships with its principal protagonists, Webern and Berg. Gál also had associations with Erich Wolfgang Korngold, Joseph Marx, Ernst Toch and Alexander Zemlinsky; all composers active on the Austro-German music scene and with links to Vienna. In 1929, against competition from well over a hundred candidates, he obtained the prestigious directorship of the extensive Mainz Conservatory on the Rhine. It is indicative of Gál’s reputation that for the Mainz appointment he gained heavyweight advocacy from Fritz Busch (director and conductor of the Dresden Opera) and Wilhelm Furtwängler (conductor of the Berlin Philharmonic Orchestra). It is thought that backing also came from the renowned composer Richard Strauss. Hitler’s accession to power in 1933 as German Chancellor brought Gál’s career to a sudden end and his hometown of Mainz was seized by the Nazis. In spite of the fact that Gál had fought for the German allies in the Great War his Jewish origins ensured that he was ostracised; losing his job, with performances and publication of his music prohibited. The extreme pressure and abuse that Gál and his family were experiencing and the impending danger ensured that in 1933 he was forced to flee to the Black Forest in south-western Germany for a few months. Finding it hard to break away from Vienna, his cultural home, Gál took the dangerous decision to return. When Hitler’s Third Reich invaded and annexed Austria in 1938 it became obvious that Gál and his family would have to flee overseas. They managed to escape to London with the objective of settling in the USA. Following a fortunate encounter with the composer Sir Donald Tovey, Gál was invited to Edinburgh in Scotland, where Tovey was University Professor of Music. Employed with the task of cataloguing the Reid Music Library the promise of a teaching engagement disappeared after Tovey’s death and Gál returned to London. After the outbreak of war in 1939 Gál moved back to Edinburgh into the home of Sir Herbert Grierson who had been English Professor at the University. Gál was categorised as an alien by the British authorities and as a ‘security risk’ he was subsequently arrested in May 1940. Together with all other Edinburgh refugees he was sent to an internment camp at Huyton, Liverpool, then a short time later transported to the Isle of Man for detention. In 1940, the British Government’s policy of internment changed and Gál was given his liberty, and decided to return to Edinburgh. Gál’s fortunes improved considerably following the conclusion of the Second World War and he secured a permanent position as a music teacher at Edinburgh University. Maintaining his involvement at the University after retirement age, he resided in Edinburgh until his death, in 1987, aged 97. The multi-talented Gál had gained an excellent reputation in Edinburgh’s music circles, as a composer, performer, teacher and the author of biographies on Brahms; Schubert; Wagner and Verdi. Together with Rudolf Bing, the Vienna-born opera impresario, Gál was a founder member of the Edinburgh International Festival. Although the recipient of several prestigious honours both in Britain and abroad, and remaining active as a composer up to his death, Gál was never able to re-establish the success of his pre-war career. Once acclaimed by the members of the central European music establishment, Gál’s music had become unfashionable. Taste in music had rapidly changed in the first half of the twentieth century and the late-Romantics of Gál’s generation became marginalised having to compete with the growing enthusiasm for influential modernists such as: Bartók, Stravinsky, Schoenberg and Berg. Gál was a victim of the new vogue as he was still composing in the manner of a bygone generation and consequently his music moved into virtual obscurity. However, in the last year of his life, the music experienced increased public attention with the first British radio broadcast of his cycle of four string quartets and the cantata: De Profundis, Op. 50 (1936-37). For those readers interested in exploring these complete works for string quartet I can report that Gál has a style in the Austro-German late-Romantic tradition. At times I was reminded of the music of Max Reger with certain echoes of Paul Hindemith and also Cyril Scott; composers who both trained at the Hoch Conservatory at Frankfurt-on-Main. The emotional tension, violent rhythms and frequent dissonance of the six quartets of Béla Bartók, Gál’s older contemporary, are some considerable distance away. The four movement String Quartet No. 1 in F minor, Op. 16 was written in 1916. The Hans Gál website claims the score was premièred by the Rosé-Quartett in Vienna in 1916, however, the Meridian booklet notes state that it was dedicated to Adolf Busch and first performed by the Busch Quartet. Erwin Kroll described the score as "Schubertian" and Wilhelm Altmann as, "somewhat in the style of Brahms, it is also indebted to Schubert and to the general musical milieu of 19th century Vienna." The comparisons of Gál’s music to Schubert and Brahms given by Kroll and Altmann are not sound-worlds with which I can readily identify. I experienced Gál’s score as rather idiosyncratic, bereft of Schubertian bitter-sweetness and although well-crafted and highly attractive, without the melodic and stylistic memorability of those great Viennese masters. The opening movement Moderato, ma con passione contains a Dvořákian nostalgic yearning and I enjoyed the urgency of the impishly scurrying Scherzo. The extended Adagio is unrelentingly tense with a mysterious atmosphere bordering on the sinister. Clearly the product of a fertile imagination, the multi-faceted finale, marked Allegro energico, un poco sostenuto provides a temperamental if not an especially memorable conclusion. From 1929, the String Quartet No. 2 in A minor, Op. 35 is cast in five movements and was given its first performance in Vienna in 1930 by the Rosé-Quartett. In the opening Preludio the increased use of more, "astringent harmonies occasionally bordering on the atonal" is apparent. A Scherzo-like second movement Toccata is snappy and outgoing in character with rapidly changing textures. Tense and uneasy at times the Canzone suggests searching for a calm resolution and the short, dance-like Intermezzo contrasts a sense of aimless wandering with the thrill of the chase. The final movement is an agitated Rondo and the work concludes in a composed manner providing a welcome relief from the anxieties that had gone before. In four movements the String Quartet No. 3 in B minor, Op. 95 composed in 1969 was premièred in Edinburgh in 1970 by the Edinburgh Quartet. Marked Energico the lively, extended opening movement is just bursting with nervous energy and the appealing Scherzando has considerable poise that evokes the Viennese Ländler. A searching, moody and airless Cantabile - Adagio could easily depict Gál reminiscing over a lost love and the finale marked Con umore - Allegretto is concentrated, yet impressive with considerable emotional tension. Composed in 1970, the four movement String Quartet No. 4 in B flat major, Op. 99 was given its first performance by the Edinburgh Quartet in Edinburgh in1972. Compared to the first quartet, written some fifty-four years earlier, one is aware of Gál’s liberal use of chromatics and harmonics of a greater complexity. I found the lengthy opening movement Legend marked Adagio-Allegro reminiscent at times of a Britten quartet with a strong sense of undergoing a continual searching process. The capricious, short Burlesque feels evocative of a merry-go-round at a fairground and the genial Elegy contains a soothing lyricism as from a bygone Viennese age. Concluding the quartet is a rather puzzling hybrid movement with an agitated Fugue and a hard to define Capriccio. The Improvisation, Variations and Finale on a theme by Mozart for string quartet, Op.60b is an arrangement from the original score for mandolin, violin, viola, lute or cello, Op.60 from 1934. It seems that Gál also made an arrangement for mandolin orchestra. The score for string quartet is happy-go-lucky, full of jaunty and fast-moving episodes. I especially enjoyed the charming and pastoral opening piece, Improvisation, that could have been written by Vaughan Williams or Finzi. The Five Intermezzi for string quartet, Op.10 was composed in 1914, premièred in Vienna in 1916 and is his earliest published work for string quartet. Evidently there is also a small orchestra arrangement by Beece of movements 1 and 2. The Five Intermezzi is an attractive and genial Serenade, and one notices the folk-like melodies that suffuse the score. The Edinburgh Quartet displays secure ensemble and an agreeable timbre. Playing with considerable conviction, their convincing empathy for the music conveys a sense of eavesdropping on a private recital. In particular, one feels that the chosen tempi permit Gál’s intentions to register with maximum effect. The recorded sound is clear and well balanced. Although not mentioned in the accompanying annotation Meridian have informed me that the recordings were made at Broughton St Mary's Parish Church in Edinburgh in November 2003 (Vol. 1) and September 2004 (Vol. 2). The set has the additional benefit of exemplary booklet notes by Roger Bevan Williams. These are satisfying and accessible string quartets in the Austro-German late-Romantic tradition. Lovers of rare chamber music will be in their element with this splendid set.